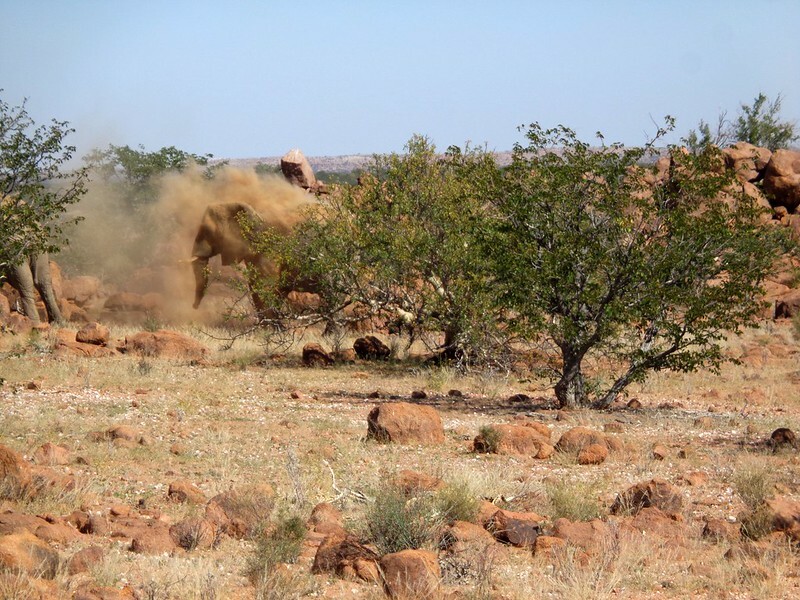 We had been told that desert elephants and lions would often cross the campsite. A sign at reception said so. 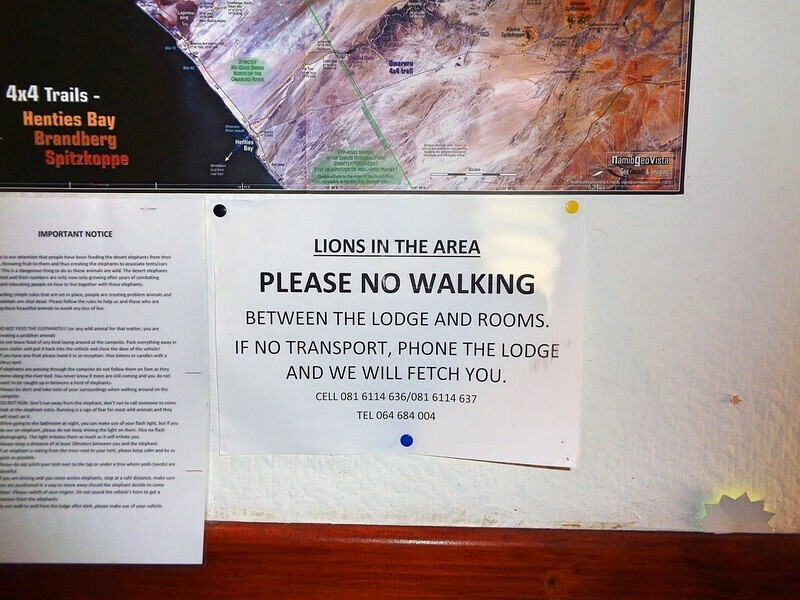 And the staff at the lodge warned us to have a fire at night and not walk around after dark, under penalty of being eaten by lions. Ok, maybe they did not say that last bit! So, as instructed by the receptionist, who said we had to have a fire going at night to keep the lions away, we duly ordered some wood then rode to the campsite. The campsite was widespread. The camping spots had only a built up place to make a fire, but nothing else. Certainly nowhere to sit. As there was one of those huge tourist truck which include cook, driver and guide, I walked over to see it we could borrow a couple of chairs for the evening. They had piles of those. My request was flatly refused. I guess if something happens to the chairs, the staff would be charged for them? Oh well, no bad feelings. Dirt Road Cowboy and mbanzi like this. The bushes and low grass around had thorns (like 4 faced dice - anyone who ever played Dungeons & Dragons will know what I mean - with thorns on each end). Those thorns caught on the shoes and got everywhere. We were paranoid about getting any in or under the tent, as we had inflatable mattresses. One puncture and it would be a very miserable night! I had that problem in Mongolia and I didn’t want a repeat. After clearing under the tent I put my sheepskin and my big horse riding gel seat under my mattress. Then it was time for dinner. We heated a can of baked beans with some bread. We then decided to get our fire going. We were certainly hapless at this. The wood was as hard as rock and we did not have any small branches to get it started. It was all big logs! We tried using part of my lonely planet guide (very good use of a lonely planet!) and pouring some petrol, but the wood was too hard to catch fire. So setting fire to Swaziland had been for nothing ! We were a bit concerned about the lions. They had killed 40 goats and a donkey few days before, only 20kms from camp! It even made the local news! Rather concerning, especially after the lecture given at reception about them! So I looked around for help. Davidprej, squadraquota, Dirt Road Cowboy and 1 other person like this. I could see another set of campers, with big 4x4s and trailers and all the modern comfort that South Africans (obviously!) seem to bring with them when camping (everything including the kitchen sink!). It was now dark and about time to get a fire going! I walked over to them and explained our predicament. They were very kind about this and gave me some fire lighter block. Which shows that looking hapless and pathetic always get you result! Lucky that South Africans are usually very friendly and helpful! As I walked back to my camp with my precious load, a big group of people were walking across the path. Not that I could see them but just by the noise and conversations. By then, it was pitch black and I couldn’t really see as my head lamp was pathetic. They were walking in complete darkness, without light, and not bothered by the lions. As I had to cross the main path and their group to get to my spot, 3 young ladies from the group stopped to ask if I was ok. I explained my stupid problem (I can’t start the fire!) and they followed me and started the fire for us, using the fire lighter. To be fair, with fire lighter, it is very easy. That thing seemed to burn forever, long enough that our wood finally caught fire! The girls then left and the group stopped at the large organised tour camp (those of the large truck and plenty of chairs!) to sing A Capella. They had beautiful voices, rising in the dark. It was the best feeling in the world to hear those voices rising in the dark, under the magnificent night sky. With no chairs, table or anywhere to sit, with Alistair, we just stood around our little fire. I just couldn’t stop looking at the stars, so many of them! As my friend Naila told me once (she worked for the UN in refugee camps for over 20 years all over the Sahara) “in the desert the night sky feels so close that it feels like you could almost touch the stars”. She was right. With the moon only a thin crescent, it was spectacular. As I have no camera good and expensive enough to take night photos of the sky, I just leave you with the day views from our campsite. crashkorolyk, Davidprej, squadraquota and 3 others like this. with that much sand/dust, I always pack a bit of cellophane (or old film negative) to slip between the tube and seal. it's amazing what comes out! for me, it keeps the seals working on the road until I can get a proper repair done. My bike (XT250) had fork gaiters so I did not expect any problem there. 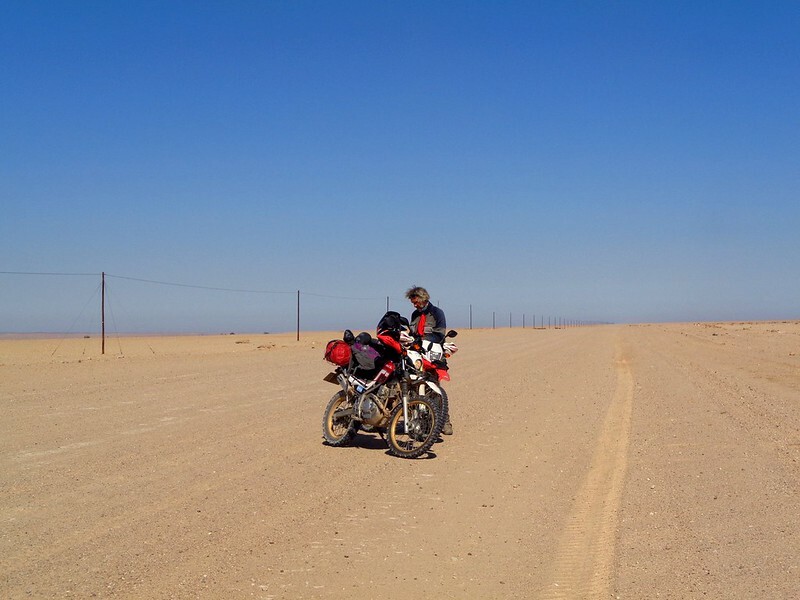 But then the bike went all round Russia and central Asia 2 years ago, so these things happen, but it is very rare. For the CRF it is more of a problem as it has inverted forks and it came with some silly screen but no gaiters. But then, we like to travel light so we did not carry spares. To be fair the point of travelling with such small bikes is that they are usually easy to fix and parts come easy too. In our 3 last long term overland trips it has been certainly the case (including when we had a engine imploding in Uzbekistan back in 2014 - see my RR on my way to Mongolia - link below in my signature somewhere if you want details ) . 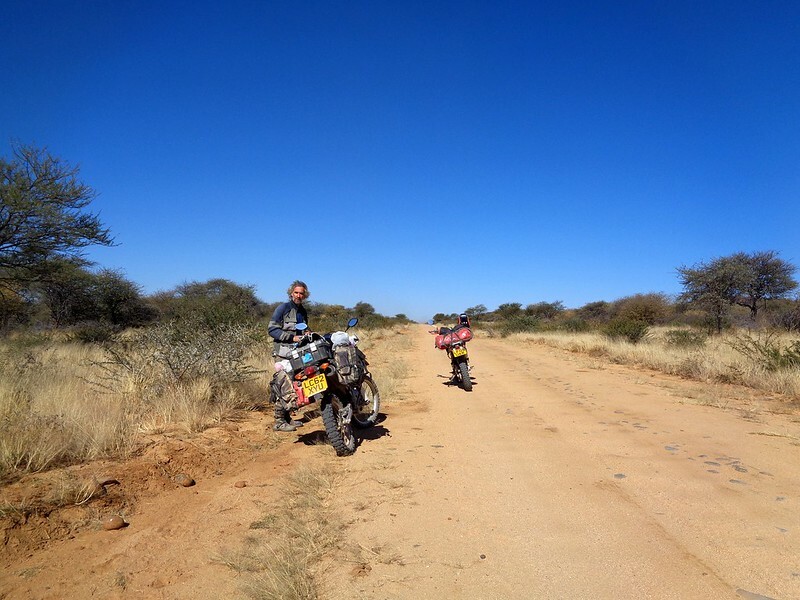 Compared with my year around south America on a BMW, we are having an easy life with our small bikes. Dirt Road Cowboy and jays100 like this. We got up early and were at reception at 8am. We had booked an elephant drive. With two other tourists we got in one of the Safari cars in search of elephants. 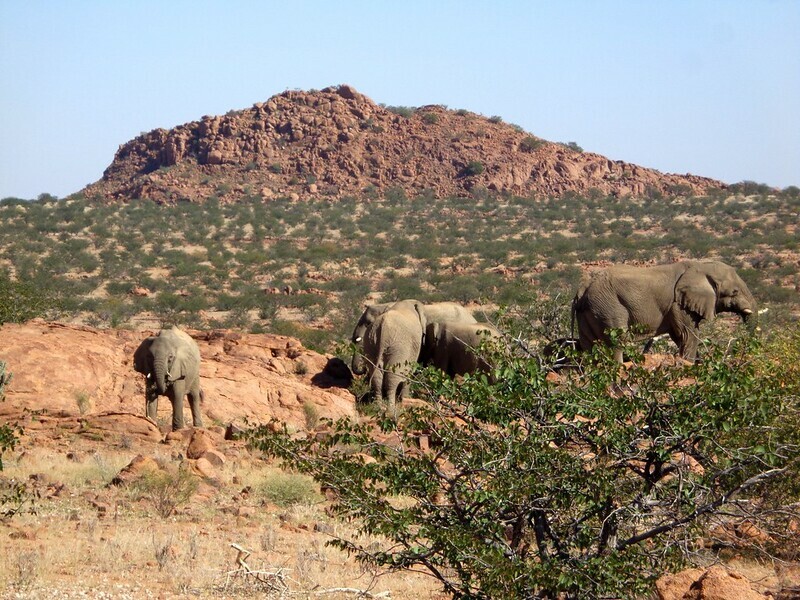 Considering how big elephants are, they seemed to be very elusive that day. The ride was usually 3 hours, but it took our guide a good 3 1/2 hours to find a family of about 16 elephants. But when we finally got to see them, it was great. 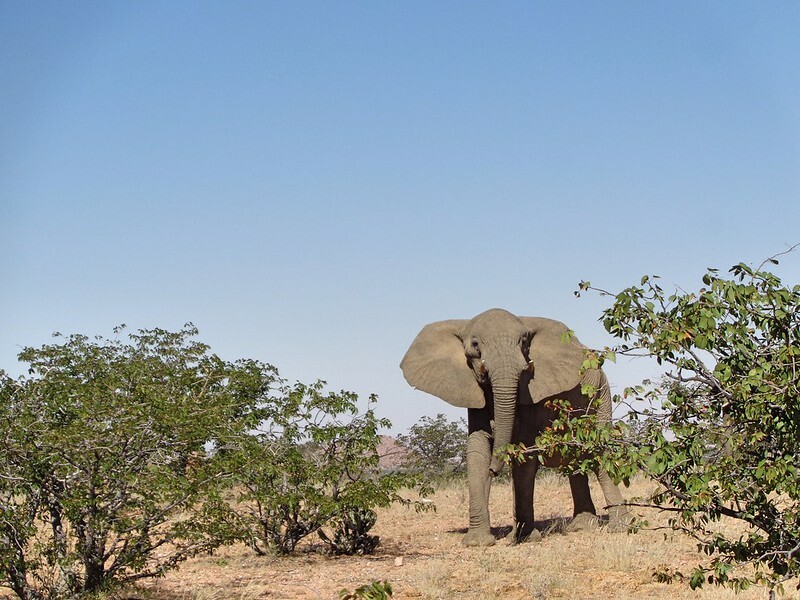 Desert elephants are the same species than savannah elephants but smaller due to their very harsh environment. After many photos we went back to the lodge. We relaxed in the afternoon by the pool, beer in hand, and got some toasted sandwiches for late lunch. Sadly nothing will ever match the toasted steak sandwich I had at Rostick Ritz Lodge! Ever! StinkyCheese, crashkorolyk, Davidprej and 4 others like this. After the previous night problem starting the fire with only large hard wood logs, , we asked the staff at reception if they could provide some fire lighter for the night, when delivering the wood. After some investigation they could not find any, but the guys setting the donkeys on fire ( you remember, that is the fire to heat water for the showers’ blocks, not real donkeys ) got our fire going. To be fair it was easy when you knew where the cardboard and little branches were stored! (By the donkeys, behind the shower blocks, in a container, if you need to know!). So with a fire going, we knew we could survive another night! I took time to thank again the guys who gave me fire starter the previous night. They were now back to camp. One of them was actually competing in some motocross competition nearby (his bike broke down ). We got some instant noodle bag in the little pot, over our fuel stove, for a light dinner. The night sky once again gave us a magnificent display. The singers were going around the campsite again. More campers and and big organised tours in those massive safari trucks had arrived earlier. The camp had filled up, So they had more work. Once again, the mix of this beautiful night with such a spectacular sky, combined with the voices of this Choir, sometime mixing gospel songs with traditional songs, was amazing. 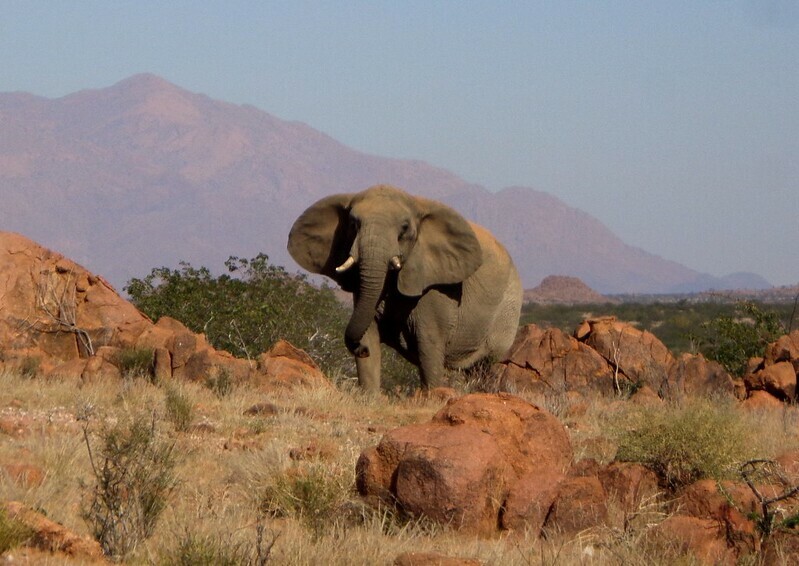 I was loving Namibia! Davidprej, jays100, joenuclear and 2 others like this. The following morning we packed camp after a quick coffee and some peanut butter with bread. It took a while to pack as we got the tweezers out to remove those horrid thorns from our shoes, our tyres and everything they got into. Some were so large they could cause a puncture on our tyres! We were finally on the way. Our 1st stop, 40 kms away was Uis again. We bought fuel and stopped at the Cactus Cafe again, for 2d breakfast! Another tea with their great cinnamon pancakes while Alistair preferred an omelet! It seems the Hereros were almost exterminated by the Germans late 19thcentury to 1904, following a large rebellion. Their numbers went down to as little at 15,000. It is estimated than in a period of 4 years, 65,000 died. Survivors were robbed of their land, segregated and forced to work in near slave conditions. German rule ended in 1915, when the Germans were defeated by South Africa. Herero men began dressing as the German oppressors while the women took the style of the missionary wives. Anthropologists think this is linked to the belief that wearing the enemy’s uniform will diminish their power and transfer some of their strength into the new wearer. 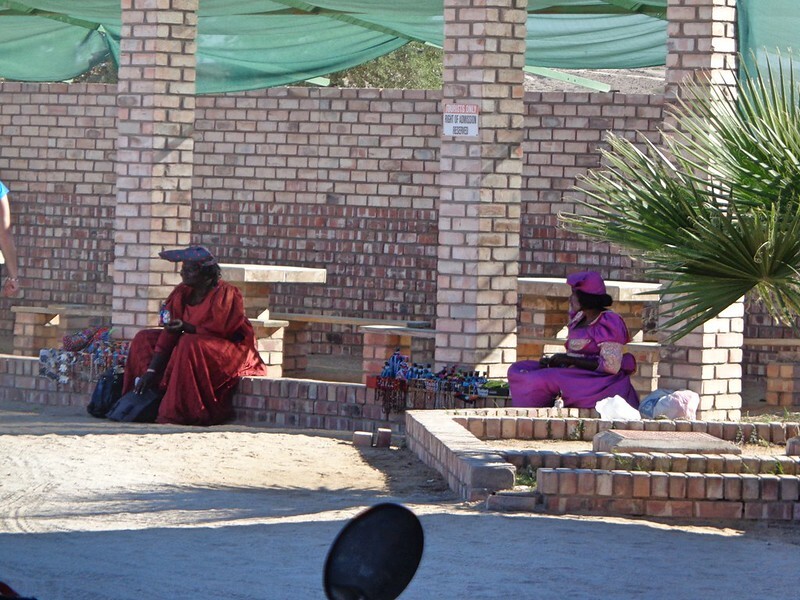 Herero women still wear this style of cloth today and they look majestic and graceful walking around dressed in those 19th century style colourful dresses. So we left Uis. 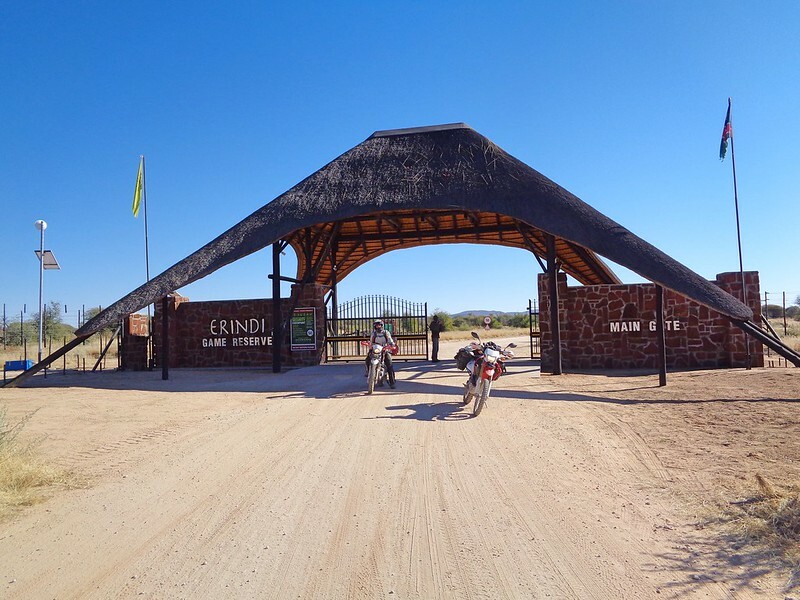 We stopped at the closest town to Erindi: Amaruru. 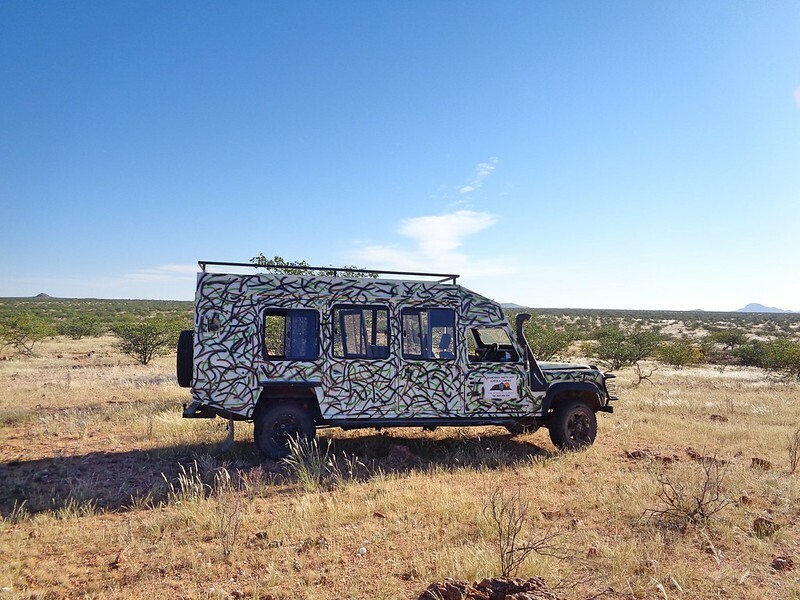 After buying more fuel we set the GPS with the coordinates of Erindi private game park campsite : Camp Elephant. 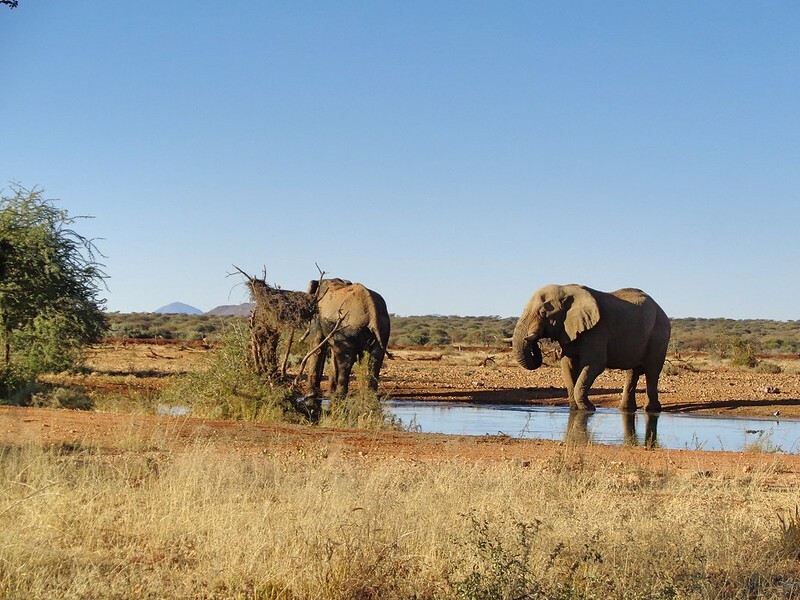 Erindi is the biggest private game reserve in Namibia. It should be easy to find you would think. Davidprej, jays100, Dirt Road Cowboy and 1 other person like this. My paper map showed nothing! 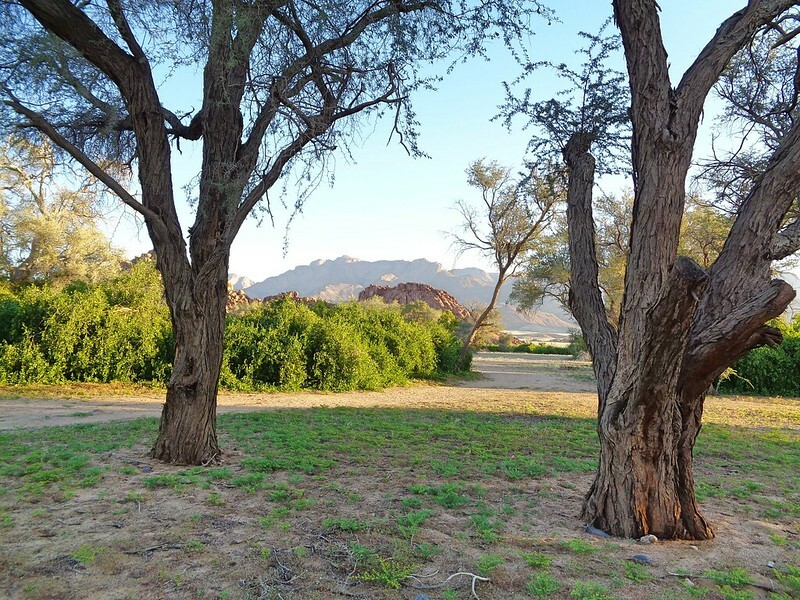 No game reserve, no campsite, nothing! To start with, the GPS calculated about 70kms from Amaruru to Camp Elephant. It took us on small tracks. Somehow the stupid GPS decided to take us through some detours for whatever reason ( don’t get me started on artificial intelligence – the sheer uselessness and stupidity of a GPS is proof enough that no AI is going to steal my job, or most jobs, anytime soon!). We ended up doing a total of 104 kms through smaller and smaller tracks. By the time we found the BACK entrance to Erindi (Stupid GPS! ), I was rather tired. The gate reminded me of Jurassic Park. It was huge. And then you had the warning board: “ enter at your own risk”; “ do not stop”, “ do not leave your vehicle”, “do not step out of your car”, “open top cars are banned”…. but somehow the armed guard (carrying a huge shotgun!) 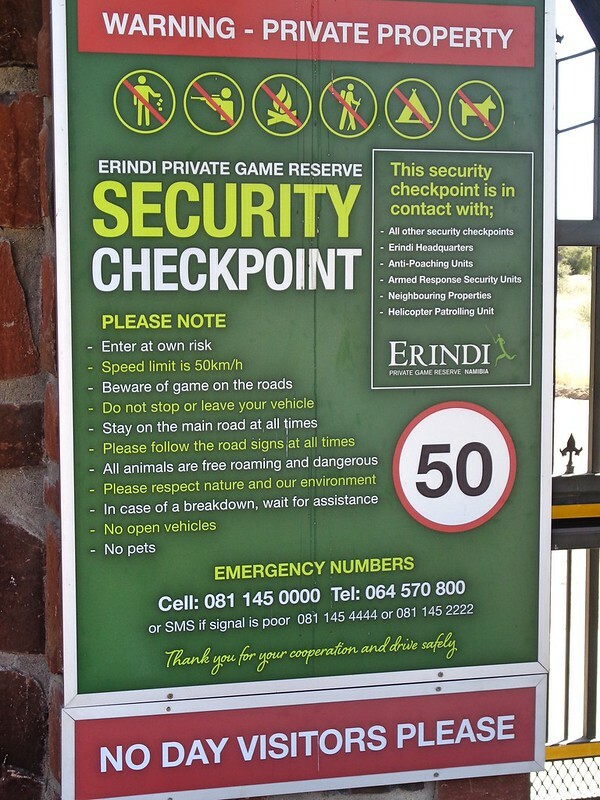 at the gate, did not seem to think that stepping into Jurassic Park, I mean Erindi, on our motorbikes, was dangerous! I asked him: “- What about the lions?”. “- Great!” I thought, “- I hope the lions got the memo!”. Oh well what could possibly go wrong?! crashkorolyk, Davidprej, BrixNaix and 6 others like this. motoqueen One Life. Live It. As we arrived to the Wildlife reserve through the back gate, we had to ride another 27kms across the park to Camp Elephant! I was gutted! It had been a long hot day and I was looking forward to get changed and have a very nice cold beer! We saw warthogs running around. We followed the guard’s instructions and the few road signs. Riding ahead, I missed a junction at some point and had to do either a large u-turn or wing it through deep sand. I chose the deep sand doing a sharp turn and made a beginner mistake. The moment I started turning and liking the wheel I knew it was a mistake! The result was immediate: I dropped the bike. I thought I was getting really good at riding through sand ! Really! But it had been a long day and I was tired. I stood next to my bike. Alistair had taken the correct turn and was out of sight. Thinking I would follow, he did not spot me. I couldn’t lift my bike! I wondered how long it would take for the lions to find and eat me!!!! Funny enough, back in London after our trip, Alistair was watching some program on TV about big cats. They were showing a pride of lions. One of the female was even stalking the safari car where the filming crew was located! They were certainly very aggressive. When I asked Alistair where it was filmed, he said casually: “ oh that is in Erindi.”! I just can’t believe they let us in and crossed the entire reserve from the back gate to camp, on the motorbikes! Nevertheless, this was the most magical place to ride! I am so glad they let us in! Davidprej, jays100, mbanzi and 2 others like this. It was my lucky day as, after a few minutes, a car with friendly South Africans turned up. They stopped and two young big lads came to the rescue! Ha…. playing the (ageing!) damsel in distress always works! By the time the bike was lifted big the 2 big lads, Alistair had joined us, and we was able to get on our way. The campsite was luxury campsite. From their website, I expected to pay 400 rands per person (about 34 $). However the receptionist quoted 1200 Namibian dollars for the two of us. For camping! At the exchange rate at that time, it was almost 100 US$! My jaw dropped to the floor! The bored and unsmiling girl at reception did not answer but after going to the back somewhere, came back and gave us a discount. We were charged 1000 rands for one night! That was about 85 USD. It was certainly the most expensive camping ever! We were given a key! Our spot included, on the outside wall of a small building, a locked fridge next to the outside kitchen sink as well as an electric kettle. There was also, on a big grassy spot with a wood table with bench and the ubiquitous BBQ. And a shaded parking bay where we left the bikes. The small building was our private bathroom. It was big. On the right hand side was the toilet cubicle, and separated by a low wall, the large walk-in-shower. On the left side a sink and built in bench. Between the sink area and the toilet and shower area, there was a very big space, big enough to fit two sleeping bags! The place was spotless. It was the most luxurious campsite I have ever been to! We decided not to bother with the tent and sleep in the bathroom instead! After a quick shower we walked to the lake. The camp had an electric fence all around. The lake was beyond the fence. There, we could see 2 huge elephants, some hippos and springboks. crashkorolyk, Davidprej, jays100 and 4 others like this. Inflicting you a rare photo of the 2 of us together! Some warthogs were running around the various antelopes as well as lots of birds that I could not identify. After a good watch and lots of photos we went back for dinner. Our camp had also a small electric cooker provided so there was no need to get our stove out. We ate a tin of curried vegetables and we added some instant noodles to it. Surprisingly good (when you have no other choice ). With another can of beer in hand and some biscuits, as the sun went down, we walked back to the lake. We could see 2 giraffes around but, although the lake was floodlit, it was too dark to take photos with my mini camera. We were really happy to have seen giraffes! The 2 elephants were still there but one hippo in the lake was getting angry with them and wanted to get out of the water on that same spot the elephants were standing! 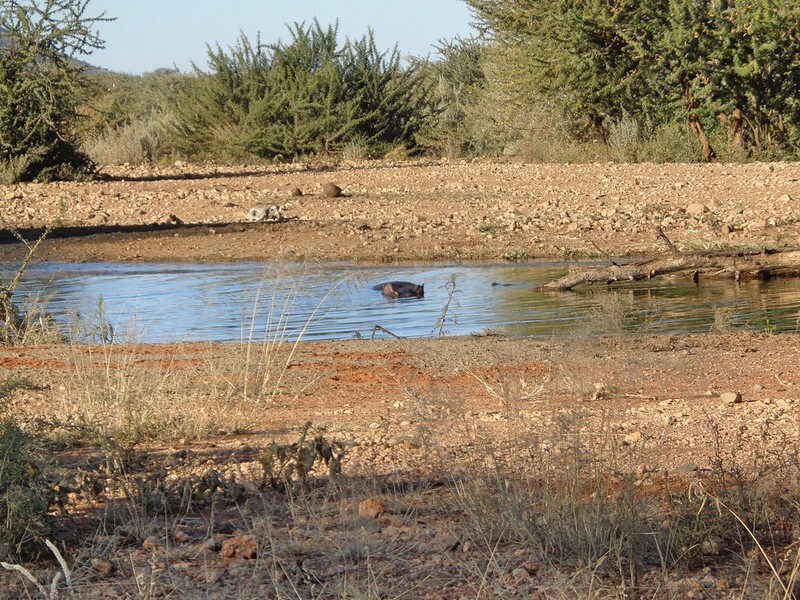 Eventually, the elephants left and 2 hippos came out of the water with much protest. Zebras faffed around while some Orix and springboks were standing around. No more wildlife came around so we went to bed. Alistair’s mattress seemed to have a small leak. Not great news! We looked everywhere for thorns. StinkyCheese, Davidprej, jays100 and 3 others like this. We decided to get up before sunrise to check the lake. Not much happening there, only few antelopes. After a while we went back to our camp for breakfast of bread and peanut butter with coffee. A very inquisitive bird, with a vey large beak kept coming closer and closer, even landing into our table, eying my bread. After the baboons in Ai - Ais, I was careful with my food! No one will steal my breakfast again ! We then went back to the lake, a bit before 9am. Few Wildebeests and antelopes that I could not identify, as well as springboks, were around. Suddenly, they all got scared and ran away. On the opposite side, Alistair thought he saw something. With no one else around in the viewing spot (some families with small kids had been doing quite a lot of noise and screaming the day before), we carefully and silently walked around toward whatever was “ over there “. Something was coming, slowly, carefully, shuffling the bushes. 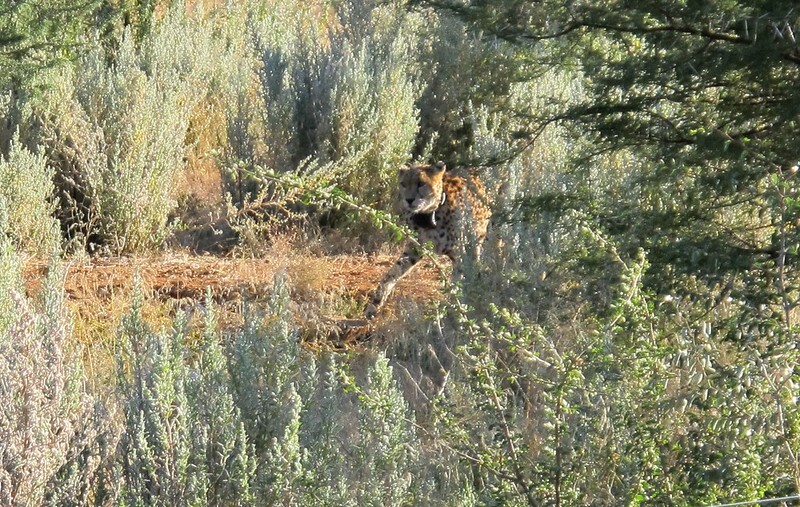 And then we saw it, hiding under the bushes, coming to drink: a cheetah! Very slowly she came out of undercover and came to drink before leaving quickly. She was beautiful! Later on, I mentioned the cheetah at the reception desk and they told me that she came every morning to drink and had some cubs. It was a magical sight! 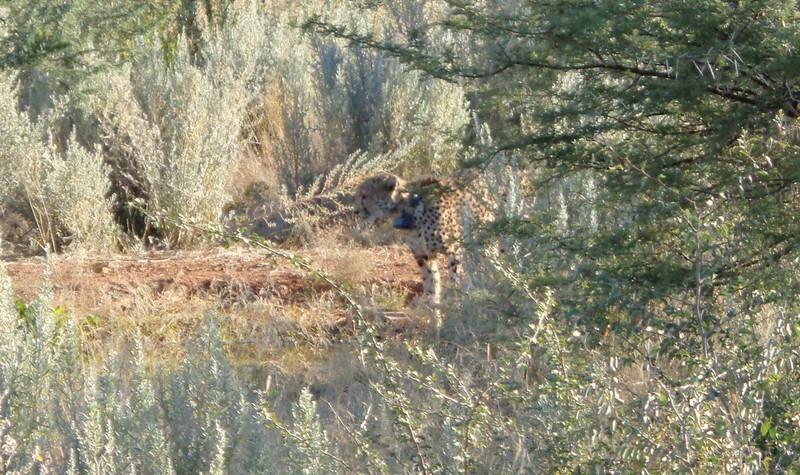 I did not expect to see a cheetah in the wild, as they tend to be very shy! It was a worthwhile visit! crashkorolyk, Davidprej, forgorin and 4 others like this. After that, we finished packing and set off at 10. 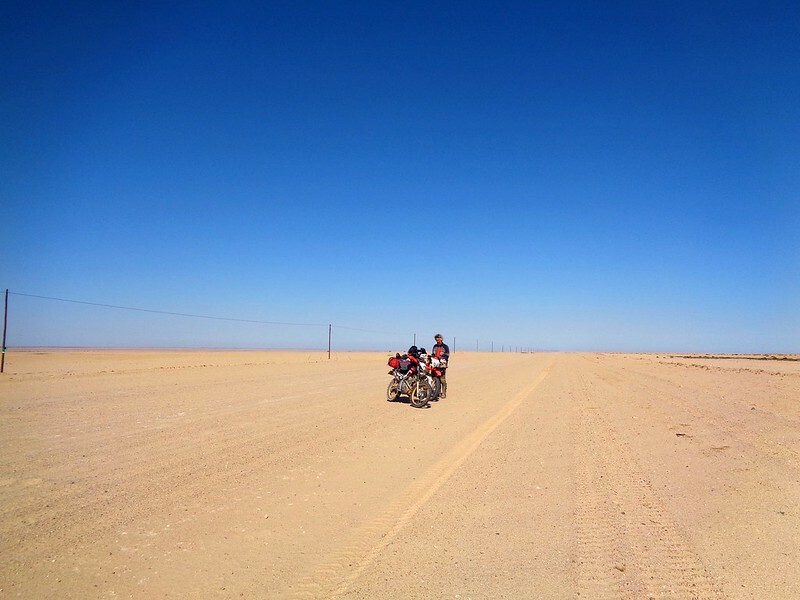 We were going back to Swakopmund to check out if our parts had arrived. And with Alistair’s mattress punctured, camping was out of the question until we fixed it. The ride, once out of the game park, took us through various farms tracks. The public road crossed into gated parcels. One of them was a private hunting lodge. At the entrance of the gate, a sign said “ Danger! Hippos and crocodiles! Do not stop!”. Hum…. I hoped they too got the “memo” about us! The tracks were very sandy and the many dry river crossings were deep sand. The road was merely a single lane farm track and we saw no one around! It was great and we made good progress. We came across many cattle gates. It was a bit of pain, as we had to open and then close them behind us. On one of those small tracks, we came across a large single Oryx, standing in the middle of the road. It stared at us for a while, wondering what the heck we were, before gracefully walking into the bush. Davidprej, joenuclear, mbanzi and 2 others like this. Eventually, we joined the tarmac road to Swakopmund. We stopped on the way for fuel and some rest. We caught the Cross Kalahari Highway. We arrived at Swakopmund at 4 pm and found a backpacker place recommended by Jolein. She had to go to Windhoek that week, so her place was closed. 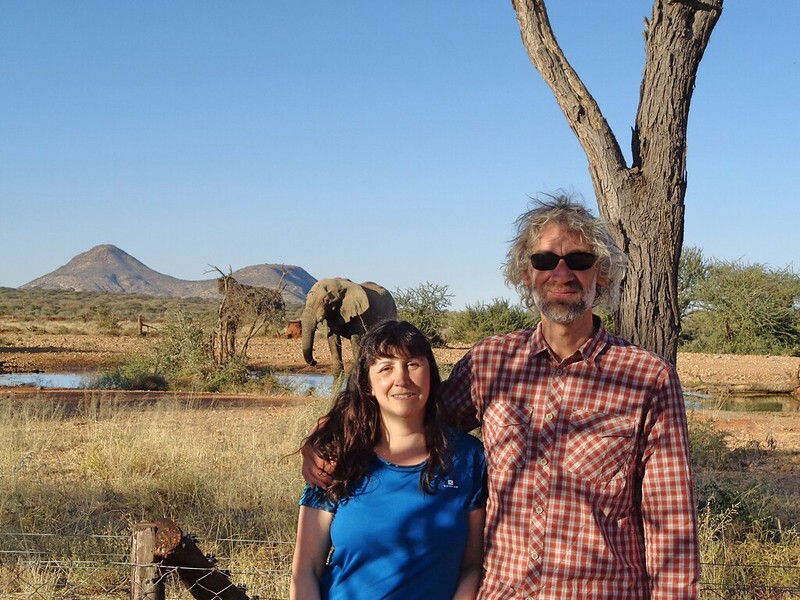 We settled at the Skeleton Coast Backpackers. It was a popular place. It included breakfast (bread, cheese, margerine, coffee, tea) and had all the facilities expected of a backpackers. The main living/dining room, next to the reception desk , had a big satellite TV and it was and where everyone tended to hang out. It had a large table on one side, then 3 big sofas around the TV. Despite the rom being fairly busy with lots of people around, it was complete silence. No one spoke to anyone else. Everyone was on his or her mobile phone or computer. After quickly changing out of our motorcycle gear, we walked to the Yamaha dealer. Our parts had arrived! That included not only the fork seals for both bikes but also the “cruises control”. So we dropped the bikes to get the job done. Davidprej, Stirba5, joenuclear and 4 others like this. We did not do much on that day. Just killing time by walking around and watching too much TV. We picked up the bikes at the workshop later that afternoon. All seemed good and we packed up in the evening, ready to leave early the next day. Unfortunately the workshop had jet washed the bikes. My XT250 was not waterproof. The control casing was cracked (it was when I bought the bike – I suspect the bike had been crashed). As a result, all my digital display was gone, and my bike was playing up when I tried to start it. With the horrendous humidity, the bike would never dry, so I would have to wing it. Davidprej and mbanzi like this. The morning was incredibly foggy. It was often the case; after all it was winter down there. We stopped for some fuel before leaving town. My bike was still playing up. Too much water somewhere. I will need to replace the meter when I am back home. On the road, I could barely see through the visor of my helmet. It was very cold. By the time we arrived at Henties Bay, 70kms later, along the salt road, I was shaking because of the freezing weather. Riding was hard as visibility was extremely poor through the visor, while at the same time I feared that if I rode too slowly, I could end up being smashed by a car from behind. After buying fuel in Henties Bay, we went to the nearby café for tea and to warm up a bit. We decided to leave the muddy salt road that runs north and, instead, pick up a gravel road going inland toward Uis. This was the same itinerary that we rode few days earlier. It would be much warmer and fog free once we got away from the sea. 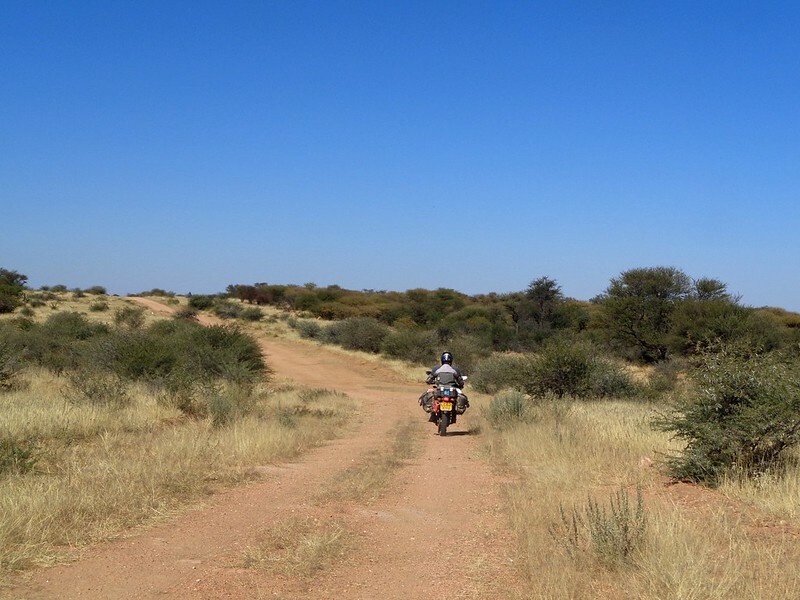 I could not face another 150kms or more of this along the skeleton coast. After another 65kms riding inland, we stopped to drink some water and to stretch our legs. We were finally clear from the fog and it was warmer. As Alistair walked around the bikes and checked our oil levels, he noticed a pool of oil on the rim of his front wheel. His trousers were covered in oil too! The brand new fork seals were a spectacular failure on the CRF. So much oil was pouring out that, surely, there couldn’t be any oil left in the forks. Davidprej, mbanzi, jays100 and 1 other person like this. We had no choice but go back to Swakopmund and straight to the Yamaha workshop. We were not happy. We turned back. We were gutted. I took the lead and rode fast. As we came closer to the coast, we could see the layer of fog still hanging far away in front of us, along the coast, like some sort of giant grey caterpillar resting along the coast, following the line of electric pylons. It was quite surreal. The weather turned colder and colder the closer we got to the fog. We hit the fog very suddenly but we barely slowed down despite the poor visibility. It was all straight road anyway and we were in a hurry! We rode to Yamaha and had a chat with the guys there. After that we go back to the Skeleton Sea backpacker place and got a room again. Shame, our previous room was big and airy, this one was on the ground floor and colder and humid. Nothing seemed to dry ever. We took the entire luggage off the Honda and rode to town to drop the bike to the workshop. We rode back 2 up on mine. The shop was going to order genuine Honda parts from Cape Town. They fitted after market brand originally, although no after market can be that bad. We suspected either the seals were the wrong ones or they fitted them wrongly. Either way, they had to put it right. After breakfast we walked back to Yamaha. They confirmed the parts would arrive on Monday (4 days later). We the Honda in the workshop, we could not go anywhere. We just had to wait. We loaded on vegetables at the supermarket and made use of the communal kitchen to cook a big chicken curry with plenty of vegetable. That would last few days. We spent those few days waiting, with not much to do. We did some washing which took forever to dry, I read few books (I loaded few Anne Cleeves murder mysteries on my iPad) we watched too many repeats of Top Gear and too much football on TV. After all, it was the World Cup! Davidprej and Dirt Road Cowboy like this. The weather was very cold, especially when the easterly wind was blowing. Sometimes, mid afternoon, if it was sunny and not windy, for about an hour, we could get warm. The backpacker place was very busy as it was very cheap. We came across a young couple riding two up on a Yamaha DR650. Jordan (from Oz) and Malina from Germany. Jordan rode from the UK. Somehow managing to get his bike through from Turkey to Israel and then to Egypt, using various transport companies and ferries. I told him that we met an American, riding a BMW, in Springbok. He asked me “- Was that Clark?”. Indeed it was! It is such a small world. 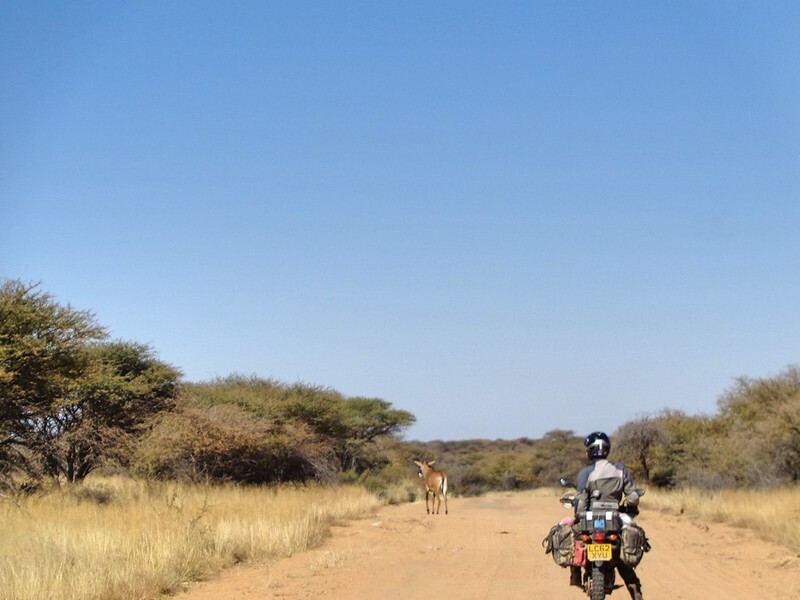 There were very few people riding around Africa at that time! Funny how we still managed to bump into each other! Jordan and Clark met somewhere in Sudan! 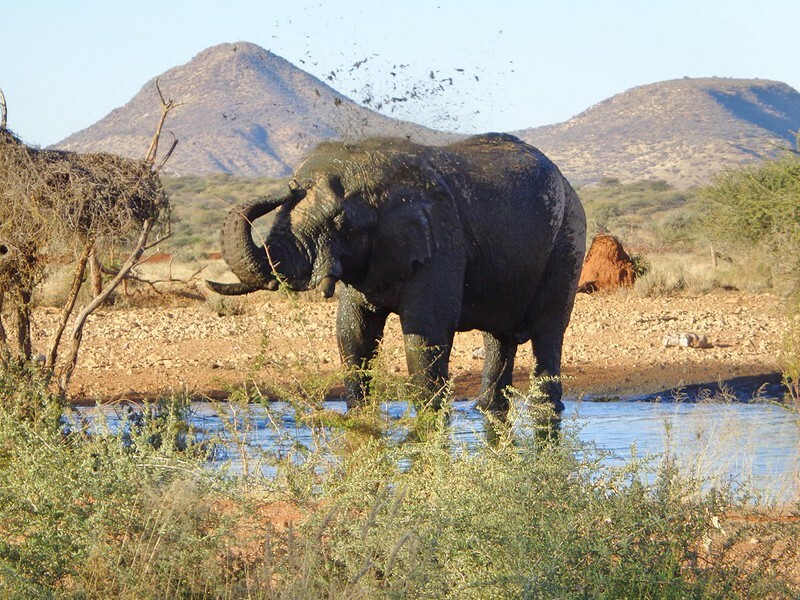 He also followed on Clark with regard to Etosha, and stayed in Onguma private game reserve. 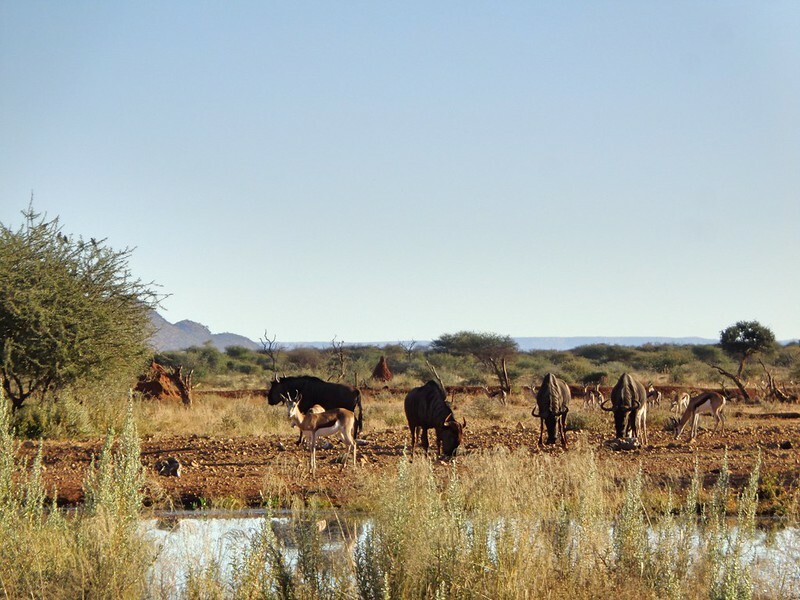 The campsite was cheap and they provided affordable Safari drives into Etosha. Motorbikes are not allowed in these parks. 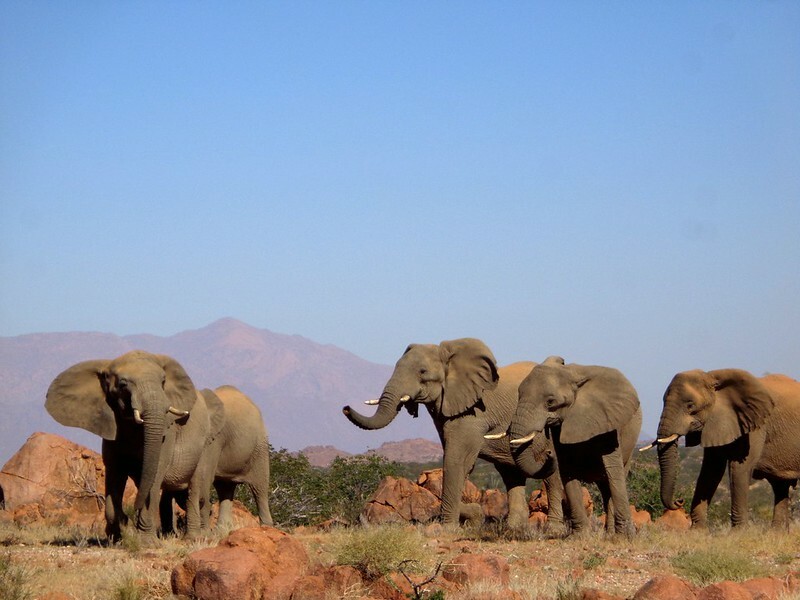 So I took a mental note of the game reserve, and we would aim for it, once we were in the area.